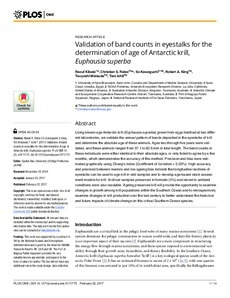 Using known-age Antarctic krill (Euphausia superba) grown from eggs hatched at two different laboratories, we validate the annual pattern of bands deposited in the eyestalks of krill and determine the absolute age of these animals. Ages two through five years were validated, and these animals ranged from 37.1 to 62.6 mm in total length. The band counts in these individuals were either identical to their absolute ages, or only failed to agree by a few months, which demonstrates the accuracy of this method. Precision and bias were estimated graphically using Chang’s index (Coefficient of Variation = 5.03%). High accuracy and precision between readers and low ageing bias indicate that longitudinal sections of eyestalks can be used to age krill in wild samples and to develop age-based stock assessment models for krill. Archival samples preserved in formalin (5%) and stored in ambient conditions were also readable. Ageing preserved krill will provide the opportunity to examine changes in growth among krill populations within the Southern Ocean and to retrospectively examine changes in krill production over the last century to better understand the historical and future impacts of climate change on this critical Southern Ocean species.